ST. GEORGE — A head-on collision between two SUVs on Dixie Drive sent both drivers to the hospital Friday afternoon. 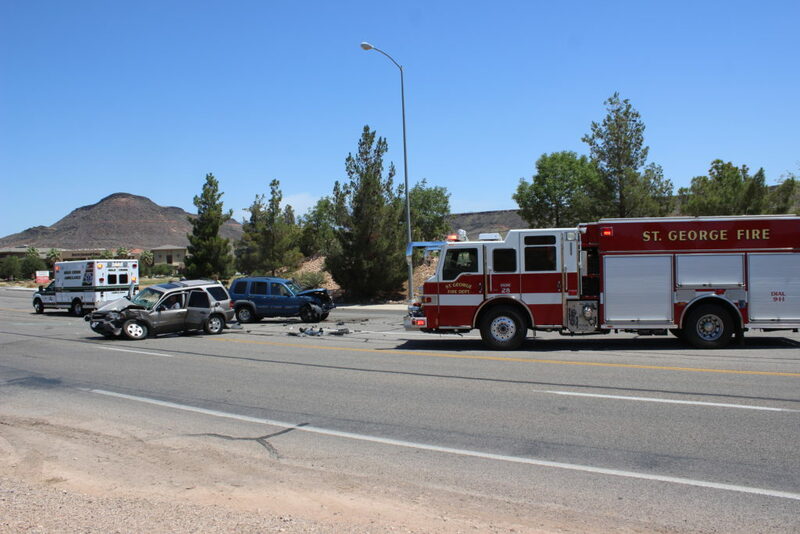 At approximately 12:20 p.m., emergency responders received reports of a collision between two vehicles at the junction of South Dixie Drive and Plantations Drive, St George Police Officer Matt Orr said. As officers arrived they discovered a gray Ford Escape had collided head on with a blue Jeep in the center lane of Dixie Drive. 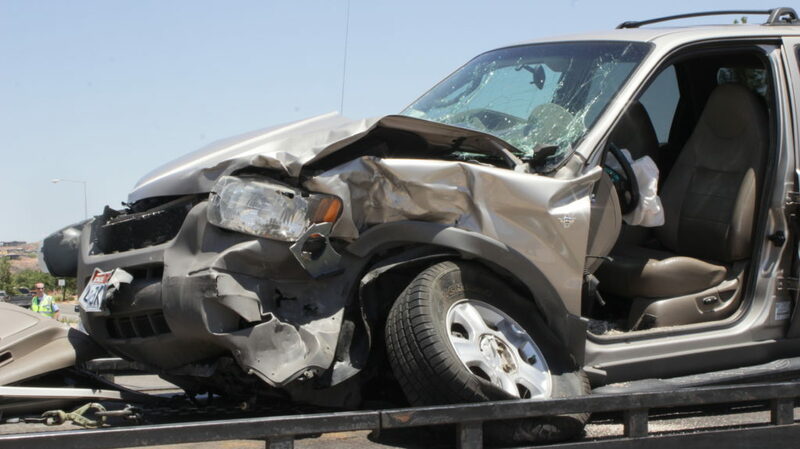 Both vehicles were driven by men and neither were carrying passengers. 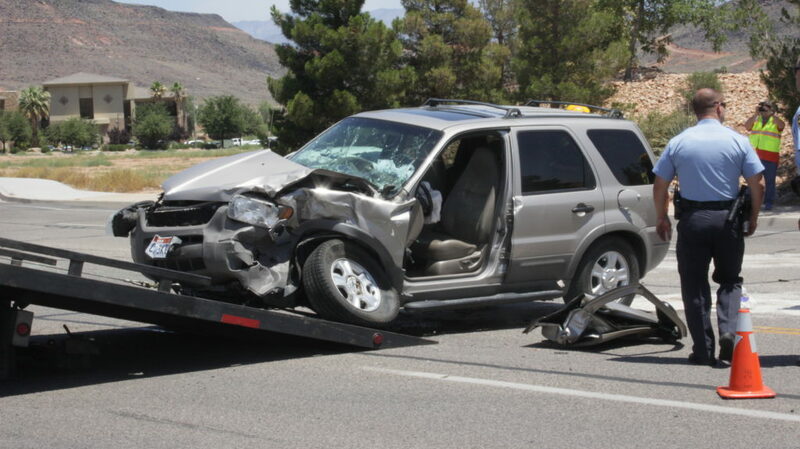 The driver of the Ford Escape attempted to make a left turn from Plantations Avenue onto the northbound lanes of Dixie Drive, Orr said, and collided in the center lane with the southbound Jeep. Both drivers sustained injuries in the accident and were transported by Gold Cross Ambulance to Dixie Regional Medical Center. Personnel from St. George Fire Department used an extrication device to remove the door of the Ford. The driver of the Ford was given an extrication collar around his neck before being loaded into the ambulance. Airbags were deployed in the Ford, but not in the Jeep. Both drivers were wearing seat belts. Traffic in both north and southbound lanes were reduced to a single lane for approximately 1/2 hour. 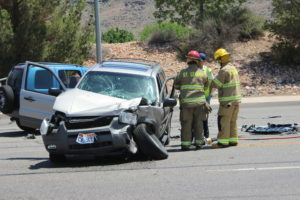 Traffic was completely stopped in both lanes for a short time while the injured drivers were taken to the hospital by ambulance and again while tow trucks removed the vehicles. An investigation into the cause of the crash is ongoing and charges are pending, Orr said. 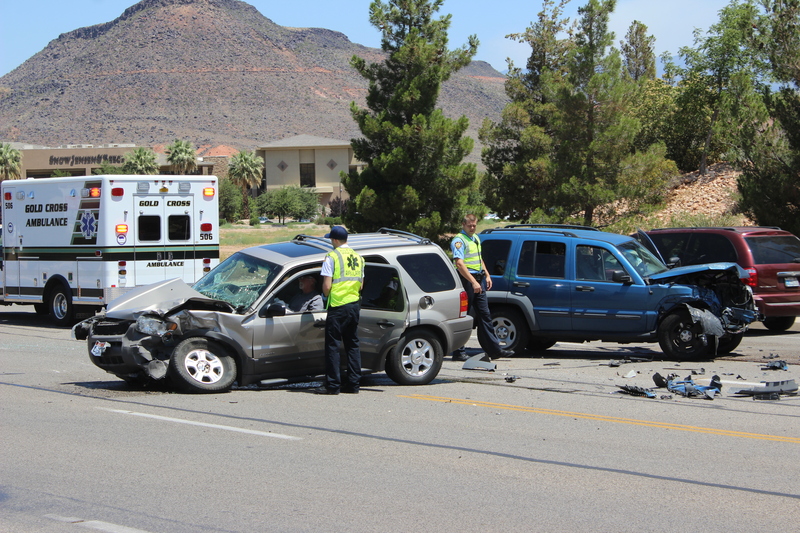 St. George Police Department, St. George Fire Department and Gold Cross Ambulance responded to the incident. I fear for my life every time I try to make a left turn onto Plantations Drive from Dixie. I wonder if this isn’t what really happened. I live off Plantations Drive, and I don’t see how this accident occurred as described, unless someone just blatantly pulled out in front of the other. Turning left onto Plantations from Dixie is a challenge, due to a median with trees that block the view of oncoming southbound traffic.